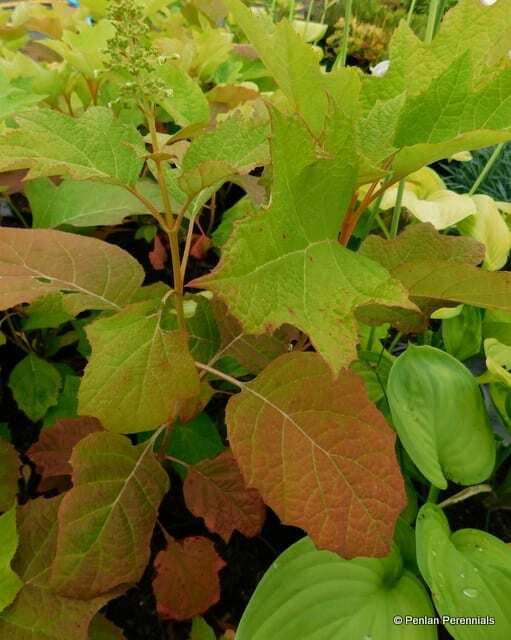 An oak leaved, spreading, deciduous hydrangea with beautiful large lobed leaves that turn red and purple in the autumn. Produces cream flowers in conical panicles from June to August. Prefers an acid to neutral soil which is moist but well-drained in a sheltered position. Ideal as a woodland plant. Pot size 2L. Hardiness rating H5 – can withstand winters down to -10C. Easy to care for. Propagate by softwood cuttings. May cause stomach upset if ingested and be a skin irritant.